Playing catch with another human is probably the best and fastest way to improve throwing skills. A stationary target instead of a fast moving super-athlete makes us throw to a spotSpot is a “go to a place”, or “go to a mat” behavior. This means that the dog seeks out and performs a duration behavior on a spot of the handler’s choosing. A Pedestal is a raised spot. Anything a dog can leap onto and perch upon. Spots and Pedestals are important dog training tools. Spot and Pedestal Playlist https://www.youtube.com/watch?v=Lubsroi69uY&list=PL8zWXaJfi1-uicOT6ElmK9YCIIxNVyIl2..., which improves accuracy. There is also much more incentive to get a throw correct when our partner can rag on us for our poor throws. When playing catch with a human partner we need to try to develop a rhythm. Each catch should transition smoothly into a return throw that is based on the hand position of the catch. For example, if we catch a disc below our waist while moving to our right, it might be a good idea to throw a sidearm toss back to our partner, as it is the most natural throw from that position, or maybe a between the legs backhand, stalling our forward motion. 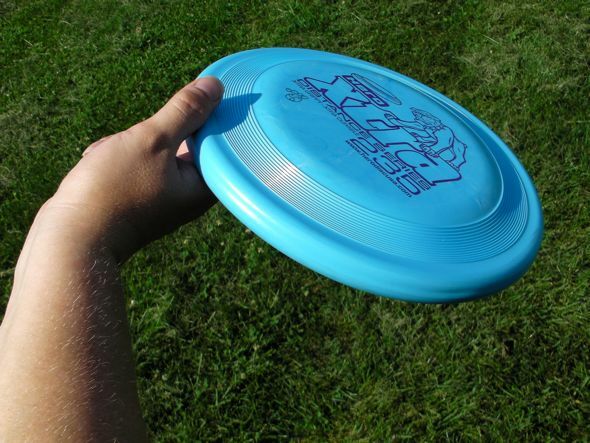 If we catch a disc above our head, an overhand wrist flip might be a good return throw. When playing catch, or freestyle, we use our finger position on the catch to decide which throw we will use after the catch. 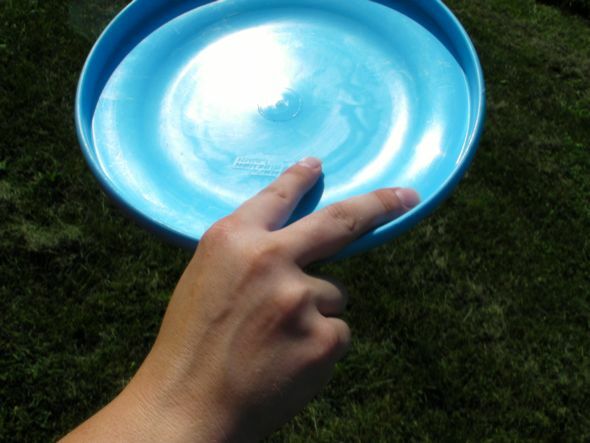 If we catch a disc above our chest, our fingers will be on top of the disc, with the thumb under the rim. This hand position will lead to an overhand wrist flip, an upside down throw, a thumb throw, and a few other weird tosses. For low catches, where our fingers are under the rim, a sidearm, regular backhand or airbounce would work nicely. 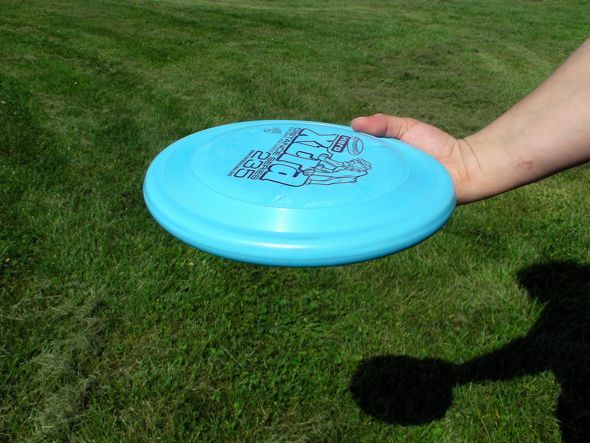 Notice that if we want to throw a regular backhand throw after making a high catch, we’ll have to flip the disc over before returning the toss. This disrupts the flow, and does not force us work on release diversity and should be considered cheating. Add spins before and after the catch, look into some trick catches, and work at different distances so we can find out how each throw behaves in any given situation. Playing human freestyle will not only help us to develop accuracy, it will also make us more creative. 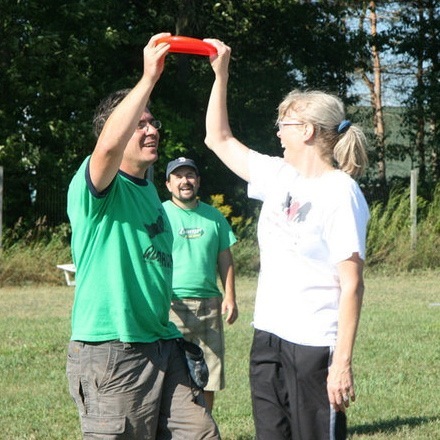 When playing freestyle, cool catches are often combined with cool throws. Maybe we make a between the legs catch and then return with an airbounce. Who knows? Keeping with the Human Freestyle as a basis of learning, we base all of our throws out of catches. 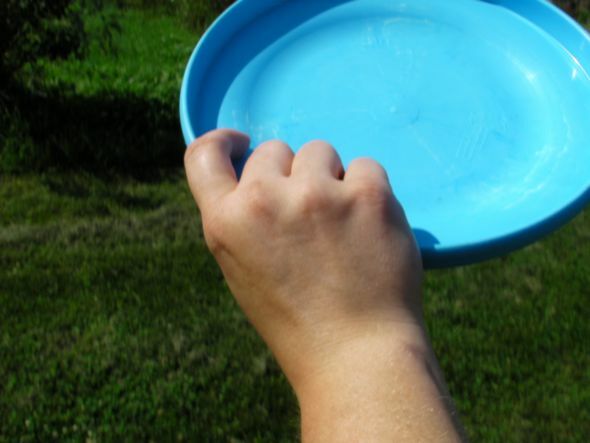 In a game of catch, you can either catch the disc High, with your fingers on top, or catch the disc low, with your fingers on the bottom. 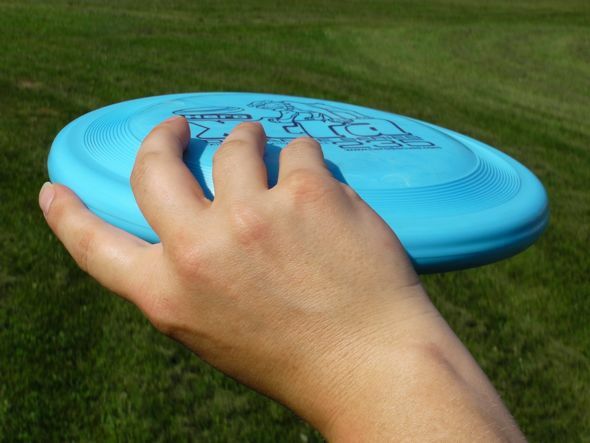 Catching at about chest level or higher likely means that the fingers on top of the disc. There are many throws that we can make from here, but we’re going to focus on two. That’s it, you need know nothing more than that to perform this toss. 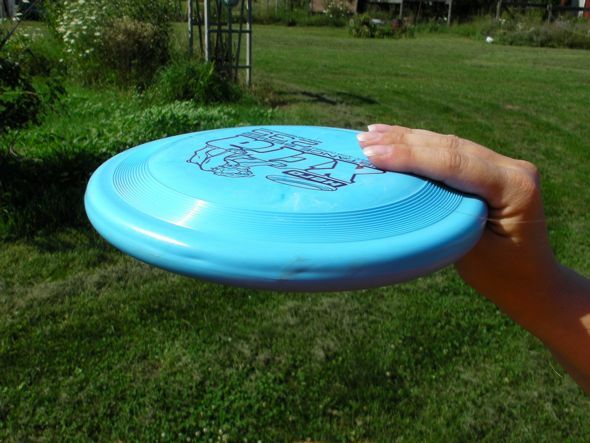 Catching below the waist usually means that the fingers are on the bottom of the disc. This allows us to make many throws, but again, we’re going to focus on two. Use backhands to make your dog look good. Start playing this game of Flowing Catch at a short distance, perhaps 7-8 yards. It is very important to start at this short distance in order to be successful. Once successful at 7-8 yards, then each partner takes a step back and now you’re at 9-10 yards. Another step back after success at 10 yards and it’s 11-12. And so on. It doesn’t take long at all to get out to 20 yards successfully with these creative releases if there is a history of success at shorter distances, but if you start out at 20 yards, you could work there for months and never be successful. It’s Catch, not Fetch… close enough to hit your partner. Make success a habit. Great video! Nice to see a beginner going through the steps. She was a good sport and caught on faster then most people do. She caught on just as fast as everyone else does when their brains are removed from the equation. This looks easy! Will test out tmrw and see for myself. This video is very helpful specially for a beginner like me and its very easy to understand. Thanks Ron!! Glad it worked for you, Lovisa! I would really like to get some more video of live instruction. It’s a bit different and I think it’s a nice wrinkle as well. Hey Ron how is the throw at 2:47 called? I cant hear it on the video? That throw is a bit different than a Thumber and it’s not quite a Staker- we call it a “Push” throw here. Is it the thump throw? “Catch High” doesn’t mean “Throw High”. Everyone wants to make this throw from over their head or ‘eyes high’. The overhand wrist flip can be thrown with your hand and arm lower than your shoulder.